Join Sarah and Brian C. the last Sunday of every month as we use wonderful books to travel the world. We are currently traveling through Cormac McCarthy's 3 part Border Trilogy, and this month we are reading Orlando by Virginia Woolf. The INTIMATES: EAST BAY QUEER BOOK CLUB will discuss Orlando by Virginia Woolf. Virginia Woolf reads from Mrs. Dalloway. Virginia Woolf , To the Lighthouse. born 1882, London (Kensington). daughter of Sir Leslie Stephen and Julia Duckworth. Married Leonard Woolf. suicide, aged 49. Virginia Woolf's book Melymbrosia was available from LibraryThing Member Giveaway. Virginia Woolf is currently considered a "single author." If one or more works are by a distinct, homonymous authors, go ahead and split the author. 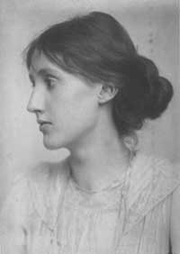 Virginia Woolf is composed of 24 names. You can examine and separate out names.